Starred Review for ENCHANTED in Kirkus! Readers who get past the generic title and an off-puttingly generic cover will discover a fabulous fairy-tale mashup that deserves hordes of avid readers. Sunday Woodcutter is the seventh daughter of a seventh daughter, living in the shadow of the memory of her eldest brother, Jack Junior, who disappeared on a cursed quest of his own. Sunday’s siblings each have their own fates and secrets. Her sisters range from twins Monday and Tuesday (Tuesday was danced to death) to Friday, who works magic with a needle; among her brothers is Trix, who is a changeling. It is Sunday, however, who becomes fast friends with a talking frog, and it is Sunday’s kiss that frees him—except she doesn’t know. Kontis has deeply and vividly woven just about every fairy character tale readers might half-remember into the fabric of her story: the beanstalk, the warrior maiden, Cinderella and Sleeping Beauty and some darker ones, too. She does this so seamlessly, and with such energy and good humor, that readers might miss a few references, caught up instead in Sunday’s cheer and vivacity, or in Grumble-the-Frog/Rumbold-the-Prince’s intense romantic nature (and his longing for his long-dead mother, the queen). 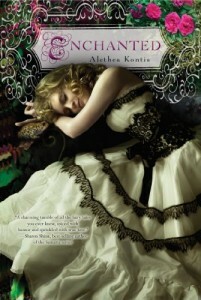 This entry was written by Princess Alethea and posted on February 15, 2012 at 12:43 am and filed under Books, Reviews. Bookmark the permalink. Follow any comments here with the RSS feed for this post. Princess Alethea, I am thrilled for you! I am also thrilled for your readers and for all the readers out there who aren’t yours but will be soon. May 8th? Do you think I have the patience of Job? Stop taunting me, woman! I’m going to get some fast food. Trust me…you think YOU’RE impatient? I’m going MAD. MAD, I TELL YOU! Seems really cool! I can’t wait to read it.